This past weekend Matt and I harvested, washed and delivered some delicious spinach. We've decided to fill you in on the truth behind this harshly misunderstood green. Spinacia Oleracea (I love saying that by the way, it just rolls off the tongue) has many varieties, two of which we touched upon this week: Red Cardinal and Regiment. 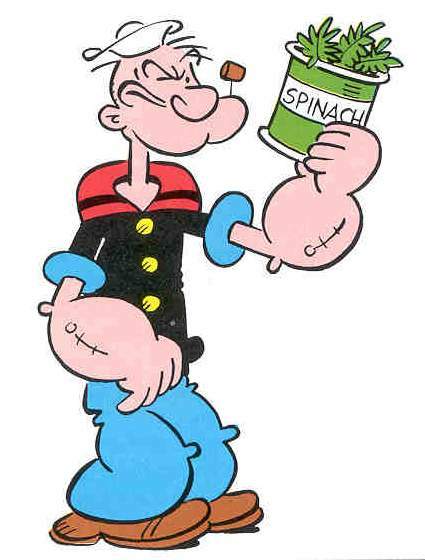 Spinach is rich in many nutrients including calcium and iron, but contrary to popular belief, Popeye was just a damn liar. It is clearly impossible to squeeze open a can of spinach, have it fly 3 feet in the air and then into your mouth, trust me we've tried all week. Oh yea and in the late 1800's a German scientist miscalculated and released a study saying spinach had 10 times more iron than other leafy green vegetables when in fact the levels were more or less the same. He missed by one tiny little decimal point, but don't get me wrong, decimal points are no jok.e Imagine if your doctor told you to take 10 times your prescription or if your bank account said 60 and not 600. That wouldn't be very funny right (well it would for everyone else, but not for you)? This confusion eventually led to the creation of Popeye in the late 1920's and since then children have been lied to. It wasn't until years later that the study was redone and re-released. By then, it was too late for the public to let go of their lovable sailor man. Popeye, our childhood hero, was a fraud. But is it so bad that we ate more spinach as a result? "I yam what I yam" more like "I yam lying to little kids for the past 80 years," but that's cool because he also taught us that excessively working out only our forearms was a good idea too! Let us not forget the spinach E. coli debacle of 2006, one of the worst E. coli outbreaks in our county's history. If you remember, the FDA worked furiously around the clock to determine its source. Some rumors even spread of a terrorist plot (no joke although I wish it was). After days of uncertainty, investigators finally determined the dangerous spinach came from farms in California mass-producing spinach. Days after that, they determined that the spinach was being grown by Mission Organics on a cattle ranch, which was sold across the country. The spinach had been sold in various grocery stores across the country, making it even more difficult to determine its source. By buying local and knowing where our food comes from and how it is grown, we can solve these problems faster and more efficiently. Now I cannot sit here and say that if everyone bought their spinach from local farmers there would be no problems or diseases, but what I can say for sure is that if everyone had known where their spinach was coming from and how it was being grown in 2006, this problem could have been resolved much quicker and on a much smaller scale which would have caused less drama and suffering for everyone. Just look at our good old friend Popeye here finally doing some research.